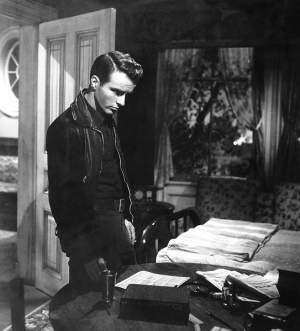 One of the new breed of rebellious Hollywood leading men that emerged in the late 1940's. Contemplating the worst in George Stevens' A PLACE IN THE SUN. His portrayal of George Eastman in this film version of the Theodore Dreiser novel, An American Tragedy, earned him the second of the four Oscar nominations of his career. The film itself was nominated for nine Oscars and also starred Elizabeth Taylor and Anne Revere. 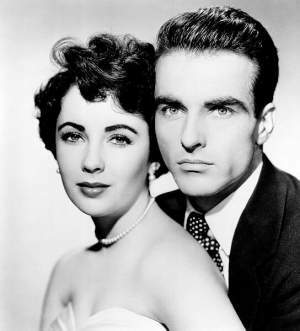 With Elizabeth Taylor in A PLACE IN THE SUN (1951). "You American women are too emancipated." --as Giovanni Doria in INDISCRETION OF AN AMERICAN WIFE (1954). 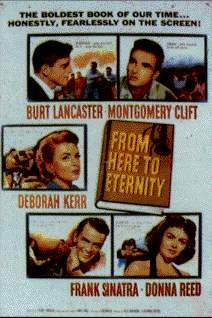 FROM HERE TO ETERNITY (1953) with Burt Lancaster, Deborah Kerr, Donna Reed and Frank Sinatra. Montgomery Clift by Maurice Leonard (London: Hodder and Stoughton, 1997). 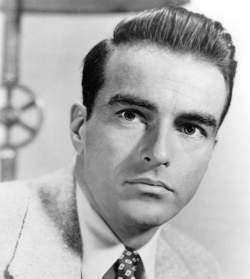 Montgomery Clift : a bio-bibliography by Mary C. Kalfatovic (Westport, Conn.: Greenwood Press, c1994). Montgomery Clift : beautiful loser by Barney Hoskyns (New York: Grove Weidenfeld, 1992). Monty : a biography of Montgomery Clift by Robert LaGuardia (New York: D.I. Fine, c1988). The films of Montgomery Clift by Judith M. Kass; foreword by Brooks Clift (Secaucus, N.J.: Citadel Press, c1979). Montgomery Clift : a biography by Patricia Bosworth (New York: Limelight Editions, 1978). Rebel males : Clift, Brando, and Dean by Graham McCann (New Brunswick, N.J. : Rutgers University Press, 1993). Five for Hollywood by John Parker (Secaucus, NJ : Carol Pub. Group, 1991). Too young to die by Patricia Fox-Sheinwold (Baltimore: Ottenheimer Publishers, 1979).